New interactive version of this resource! Cette publication est disponible en français. Our Country, Our Parliament is intended primarily for English as a second language students in grades 9 to 12 (secondary cycles 1 and 2 in Quebec), but the content can be easily adapted for use with students in grades 5 to 8 in regular stream social studies classes. The content complements provincial and territorial social studies and civics curricula. 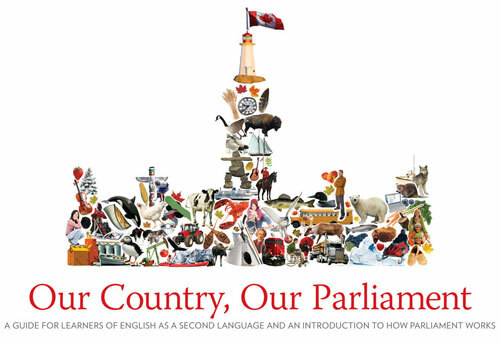 In addition to being an engaging, colourful and image-rich resource, Our Country, Our Parliament includes features to introduce new vocabulary and word usage, and that encourage students to discuss and compare systems of government across cultures. This guide integrates concepts introduced in Our Country, Our Parliament and contains suggestions for using the two resources together. We look forward to receiving your feedback about Our Country, Our Parliament and this guide.